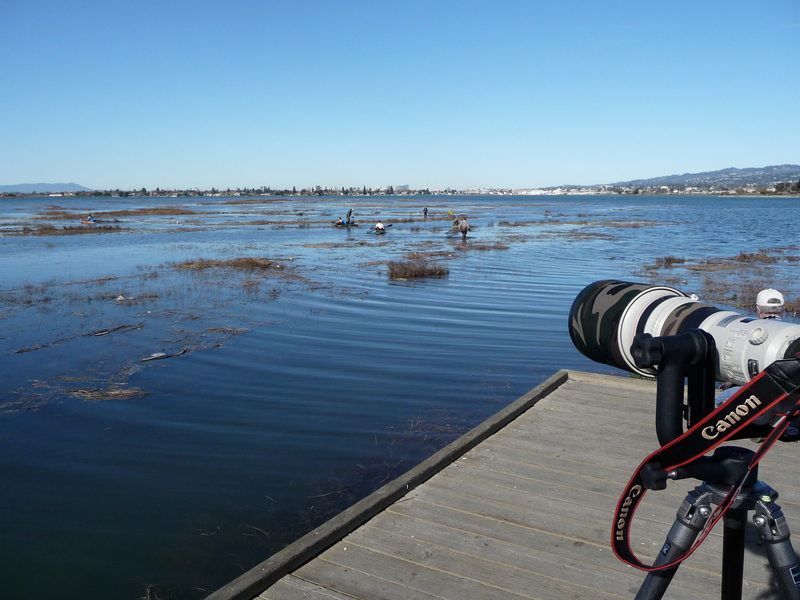 Book researcher, freelance writer, and photographer Ingrid Taylar was on hand in January 2009, when a US Geological Survey team from the Western Ecological Research Center arrived to band and radio-tag the remaining thousand or so California Clapper Rails in the Bay Area. Here's her story. 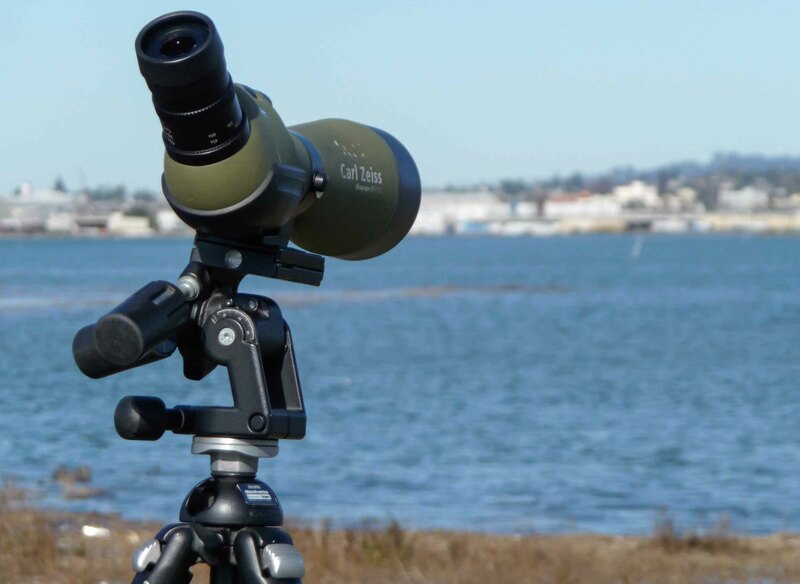 I scanned the shoreline at Arrowhead Marsh in Oakland, California, noting the row of super-pricey scopes -- the Zeiss and Swarovski kind -- where the glass is so sharp, you swear you've never seen anything right with your own bare eyes. 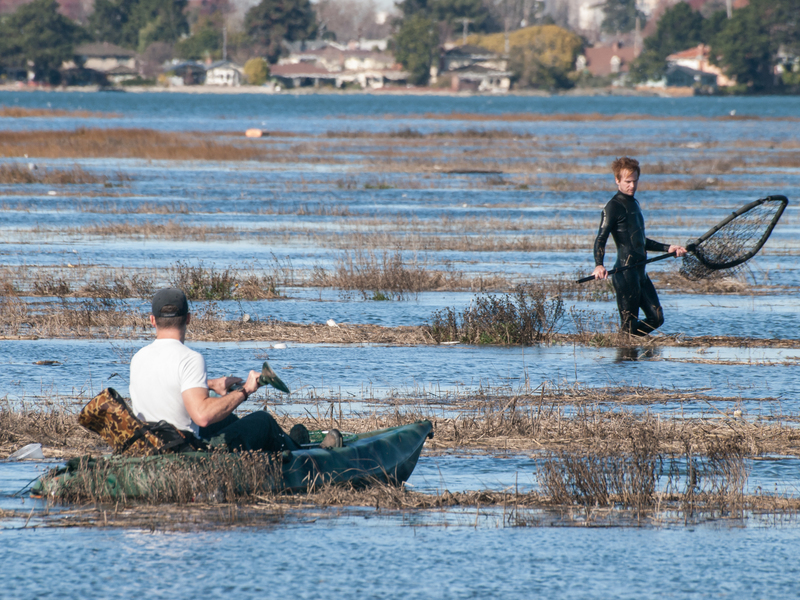 Birders and photographers regularly descend upon Arrowhead Marsh, searching the shores and sloughs for the area’s diverse bird life. 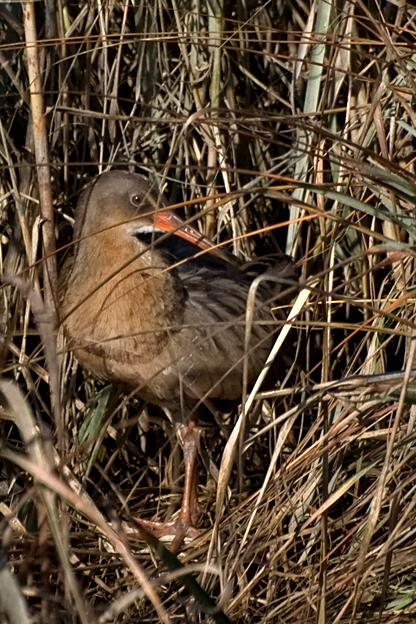 Arrowhead is also one of the remaining sanctuaries for the endangered California Clapper Rail. 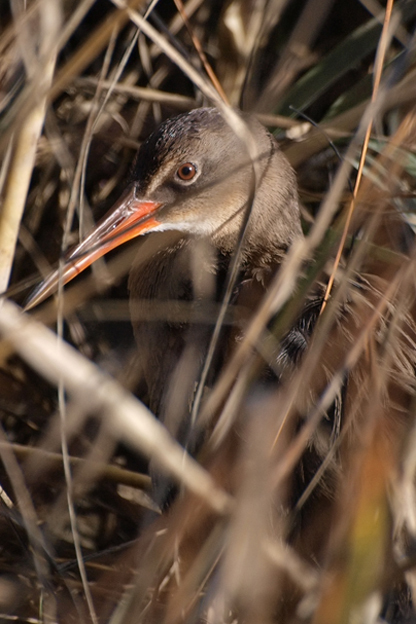 Through 1915, according to Save the Bay, the California Clapper Rail was a menu delicacy. The bird was hunted to near extinction, a sad but common fate for other Bay Area and U.S. species. Additional and significant pressures came from human development and encroachment, drained wetlands, and increased terrestrial predation. With marshes and wetlands reduced in scope, land predators such as foxes could more easily reach the rails, whose numbers came to an all-time low of around 500. California Clapper Rails are now federally protected under the Endangered Species Act, and their population number hovers around 1000. High tide is prime time for Clapper Rail viewing, a respectful vigil with observers perched on the dock or the shoreline behind their high-powered glass. The rising water makes rail sightings more likely since the tides engulf spartina stands where the birds tend to cloister themselves. 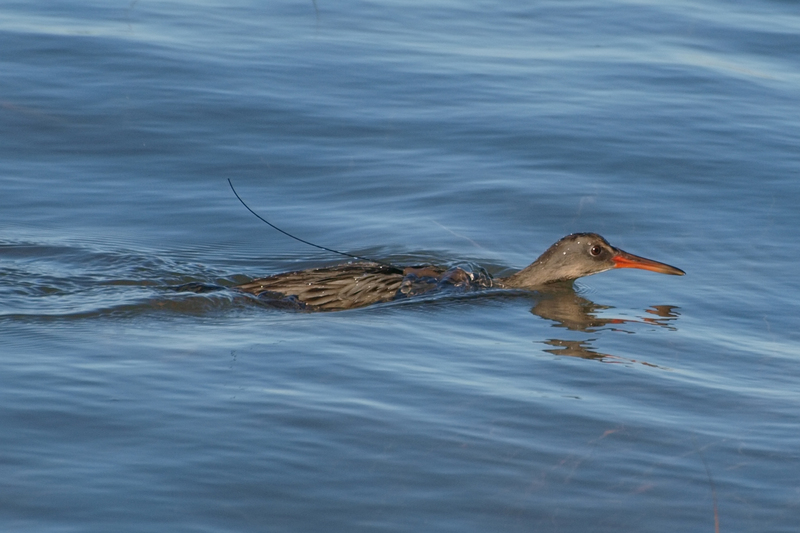 Deep water forces Clapper Rails into elevated and sparse cover, and there, the birds' orange bills are more easily spotted. This day, the +8 tide was fast and bold, breaching the buttresses along the shore. In other words, it was situation normal at Arrowhead Marsh, with light chit-chat down the scope line. 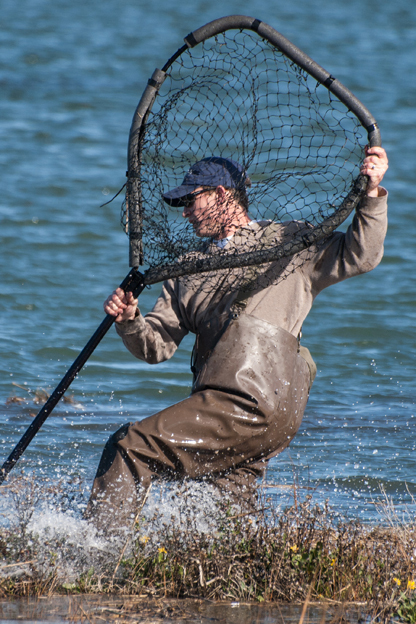 It was so uneventful, in fact, that we almost didn’t see the human crew bearing down on the marsh from the east, decked in camouflage and waders, and carrying the tools of their trade: nets, kayaks, and royal-blue pet carriers. 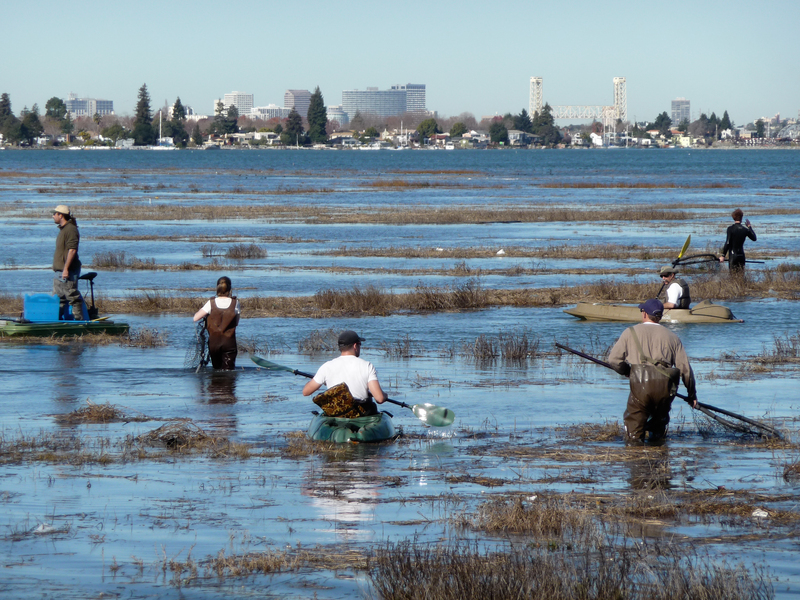 These marsh invaders were members of the USGS Western Ecological Research Center -- the researchers responsible for The Ecology of California Clapper Rails studies in the San Francisco Bay Area. 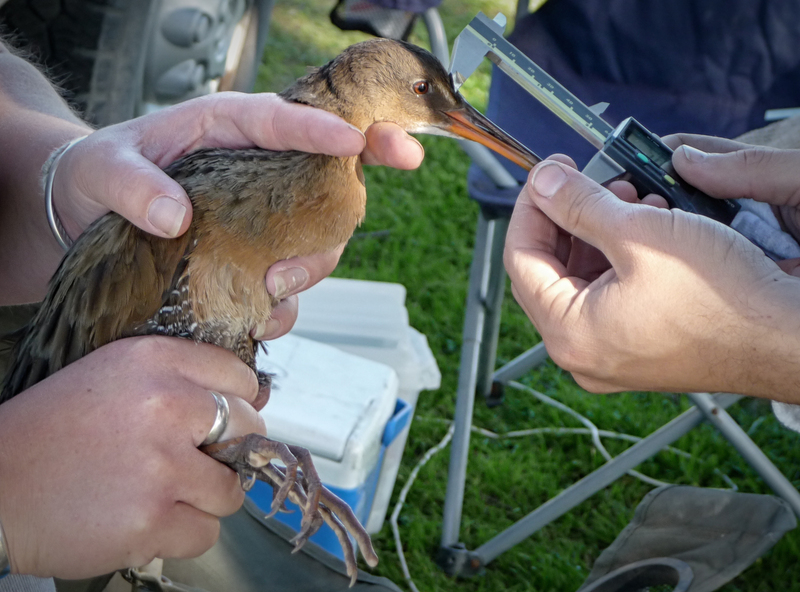 Using banding and telemetry tracking, USGS scientists collect data on the Bay Area’s Clapper Rails. 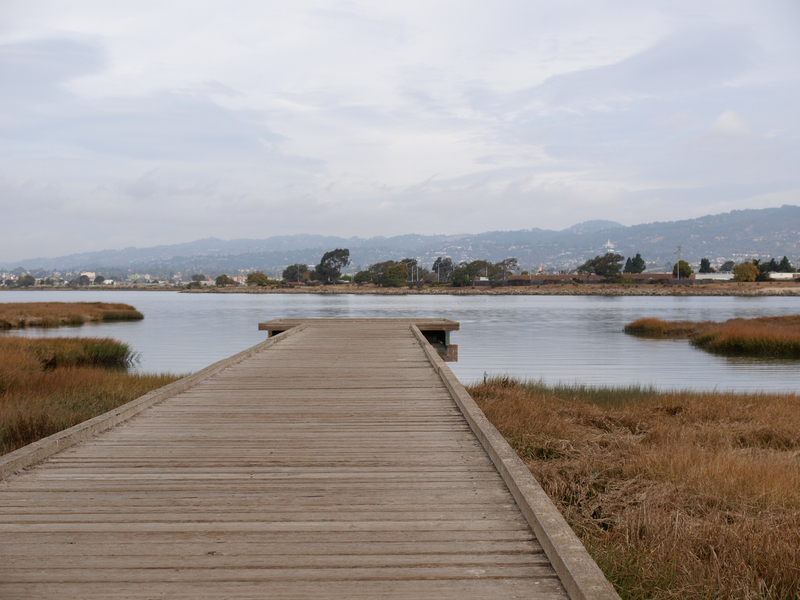 Their observations and conclusions tie in with the San Francisco Estuary Invasive Spartina Project, which aims to eradicate Spartina alterniflora, a damaging invasive plant in the San Francisco estuarine environment. This smooth cordgrass overtakes and colonizes sensitive habitat areas, to the detriment of shorebirds and the endangered salt marsh harvest mouse (Reithrodontomys raviventris). But non-native spartina also provides cover for California Clapper Rails. So, the spartina/Clapper Rail studies meet at the intersection of plant eradication and species preservation, working toward a viable balance between the two desired outcomes. I watched the capture and tagging operation with my [comparatively] tiny Olympus lens -- next to a Canon 500mm that might as well have been the Hubble for the way it dwarfed my glass. The Hubble owner was a salty photog, draped in binoculars and accessories, and slinging a second camera body across his chest. It's a wonder he could hustle for his shots, but he could. At one point, he snatched up his gear and scrambled off the dock when he thought he saw a Clapper Rail hanging in the talons of a Red-tailed Hawk. 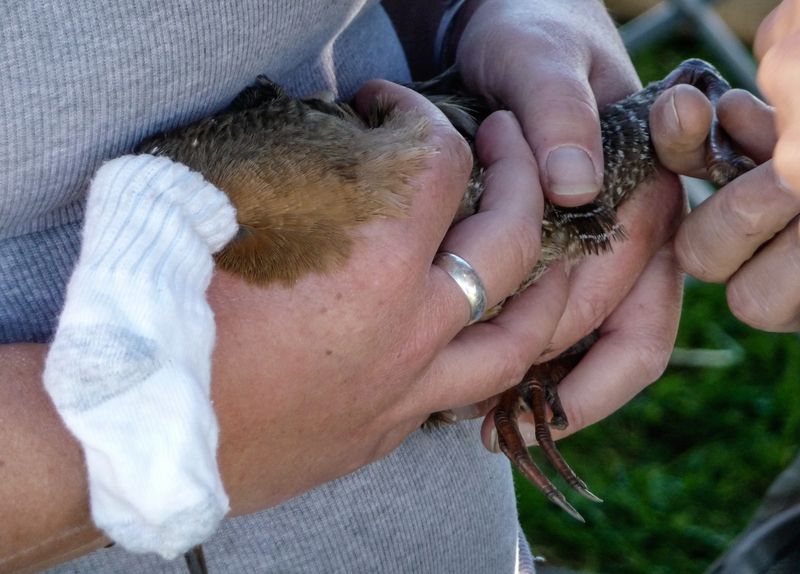 It was imagined predation; there were no injured Clapper Rails. But in the process, he left a prime position open for photographing this scene. The rail capture is an ordeal to be sure -- for the scientists and for the rails. 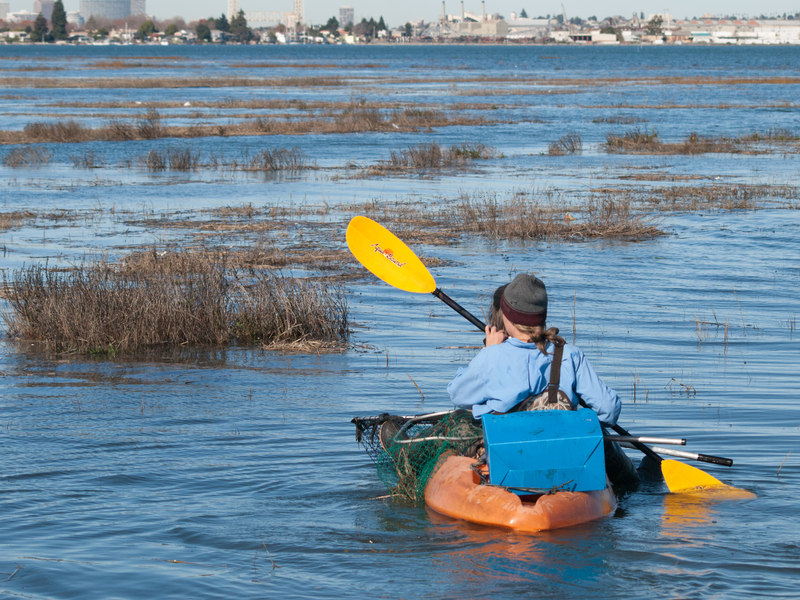 The process includes first finding the rails, which tend to flush when kayaks and waders enter the zone. 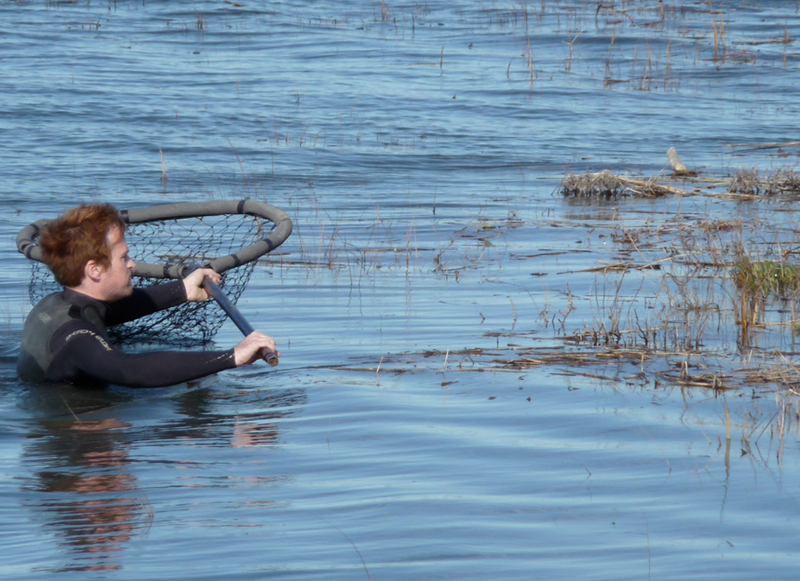 Researchers then use dip-nets to capture the birds they can reach. But the birds are slippery evaders. They can stay submerged for minutes at a time, which requires swift feet and hands when they finally do surface for just a moment. Such swiftness is impaired by the bog, which draws boots down into the mud. The process becomes a series of throwing the net, missing, then waiting for a chance to repeat. and a culmen measure (bill measurement) with calipers.
. . . cut from a baby's sock. 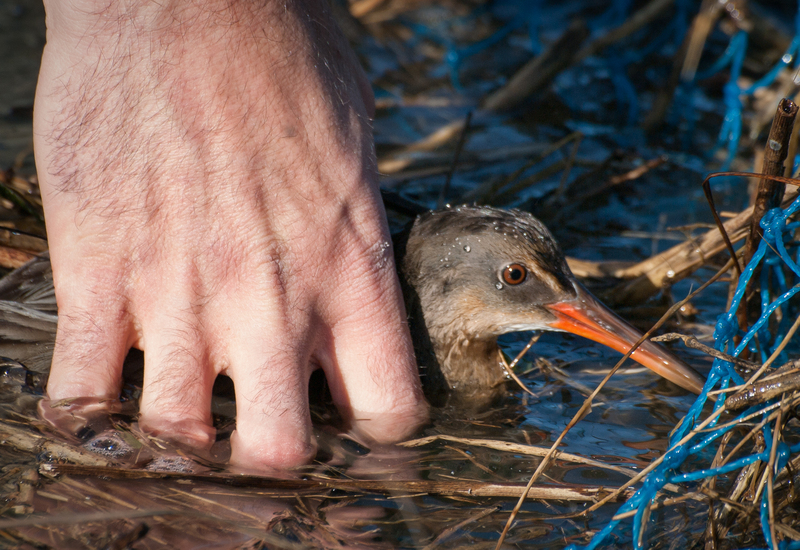 After the basic physical checks, the bird is tagged with a telemetry device and is re-released into the marsh with a backpack transmitter that weighs less than ten grams. 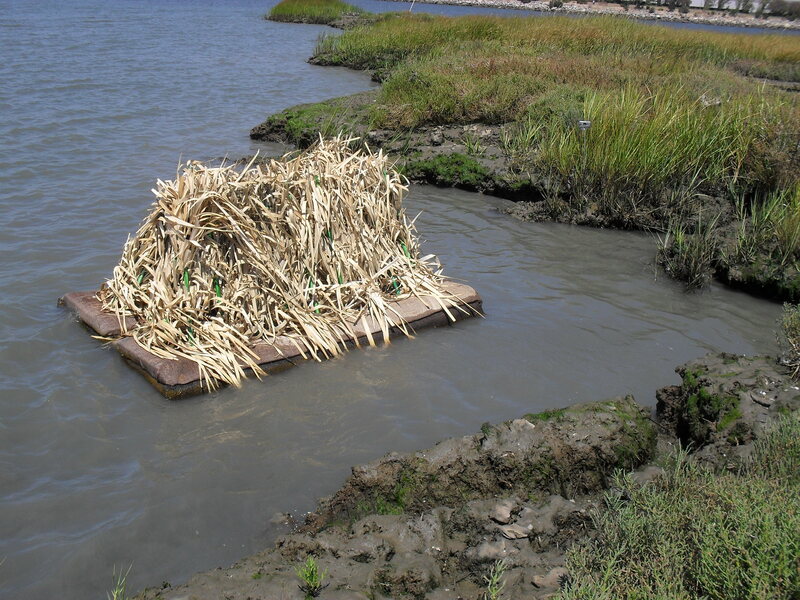 Researchers can then track and follow the rail's movements to assess its range, its numbers, its life hazards, and also determine the best way to trim away at spartina growth while at the same time retaining critical cover for the Clapper Rails. 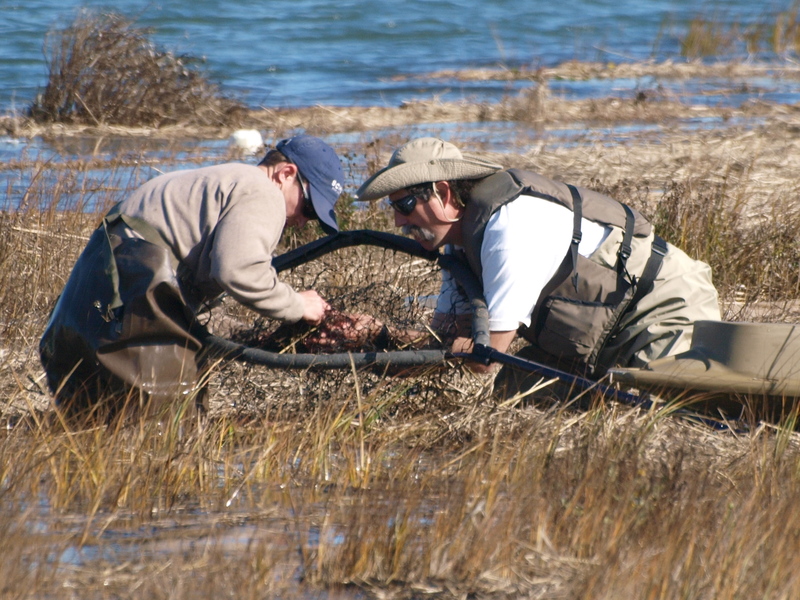 In September of 2010, USGS deployed 10 habitat islands at Arrowhead Marsh to examine the effects of both future rises in sea level and spartina control measures, which reduce plant cover for the rails. Using recycled plastic bottle materials, woven palm screens, and plastic avoidance spikes (for predators), they installed islands complete with waterproof cameras and time-lapse motion sensors. According to USGS studies, the islands received moderate to heavy use. 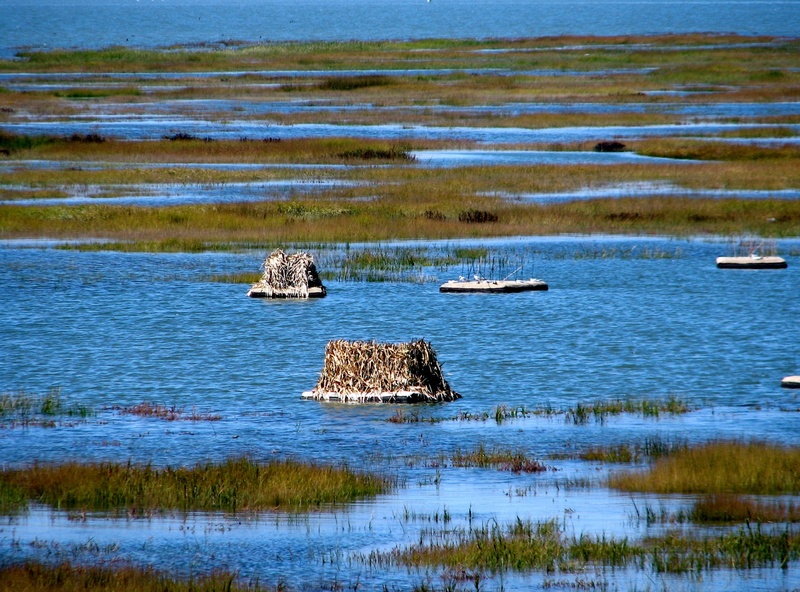 “Preliminary findings indicate that timing of island use by Clapper Rails tends to coincide with timing of diurnal high tides, suggesting that the artificial floating islands are being used as a refugia at times when the marsh is mostly or completely inundated.” The studies suggest that refugia, including elevated islands, will be key in future habitat management endeavors. A version of this article appeared on TheFreeQuark.com, January 13, 2009. All photos © Ingrid Taylar, unless otherwise noted. Pt. Reyes Bird Observatory has more about the rail!